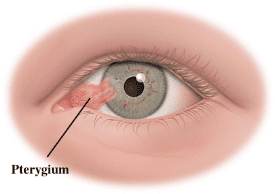 Pterygium (pronounced tur-IJ-ee-um) and pinguecula (pronounced pin-GWEK-yoo-la) are growths on the cornea (the clear front window of the eye) and the conjunctiva – the thin, filmy membrane that covers the white part of your eye (sclera). Both types of growths are believed to be caused by dry eye and environmental elements such as wind, dust, and ultraviolet (UV) light. What is the difference between a pterygium and a pinguecula? A pterygium is a growth of fleshy tissue, often arising from a pinguecula, on the conjunctiva that extends over the cornea. This growth may remain small or grow large enough to interfere with vision. 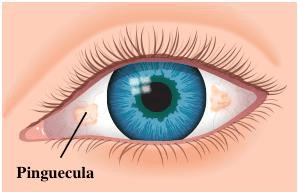 What are the symptoms of pterygium and pinguecula? In many cases, no treatment is needed. When a pterygium or pinguecula becomes red and irritated, eye drops or ointments may be used to help reduce inflammation. If the growths become large enough to threaten sight or cause persistent discomfort, they can be removed surgically. They are also sometimes removed for cosmetic reasons. Despite proper surgical removal, a pterygium or pinguecula may return. Surface radiation or medications are sometimes used to help prevent recurrences. However, the best way to avoid recurrences is to limit exposure to the environmental factors that contribute to their growth.